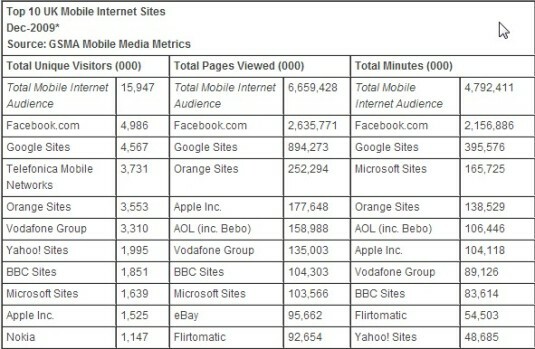 A recent survey by the GSMA shows that Facebook now dominates the mobile internet traffic in the U.K. The GSMA is the industry association for mobile phone operators. It carried out a study on mobile Internet use in December 2009. The study showed that almost 16 million people in U.K. spent nearly 4.8 billion minutes on the mobile Internet and generated 6.7 billion page views between them. Of this, nearly 50% of the time people spent on the mobile Web was on Facebook. The total number of mobile Internet users is likely to be much more than 16 million, as T-Mobile and 3 were not included in the survey. This data will be published shortly. While Facebook was visited by almost 5 million users, it was closely followed by Google, which was used by 4.57 million users. Users did not spend anywhere near as much time on Google, though, as they did on Facebook. The figures were released by the Mobile Media metrics service, which has been recently launched by the GSMA and comScore, to help various brands and agencies to set up their mobile ad campaigns and to judge the response they receive, to these campaigns. Mobile marketing has definitely been on the upswing lately. Mobile commerce showed significant growth in the 2009 holiday season and reports predict that mobile Internet access will overtake PCs in 2013.